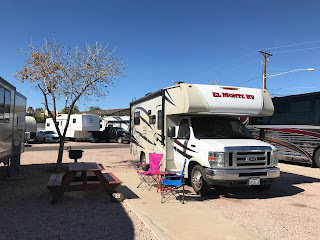 Thursday, February 7 -- We left the Lost Dutchman State Park in Apache Junction for a short drive to the Apache Palms RV Park in Tempe. Apache Palms is a small, well-kept park in the city of Tempe. Wayne made reservations months ago when we started planning this trip. 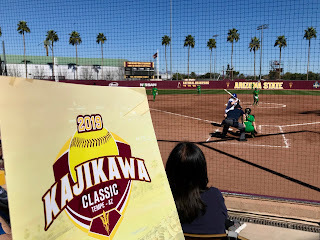 He wanted to guarantee we had a place to stay close to the Arizona State University campus so we could attend the Kajikawa Women's Softball Tournament this weekend. 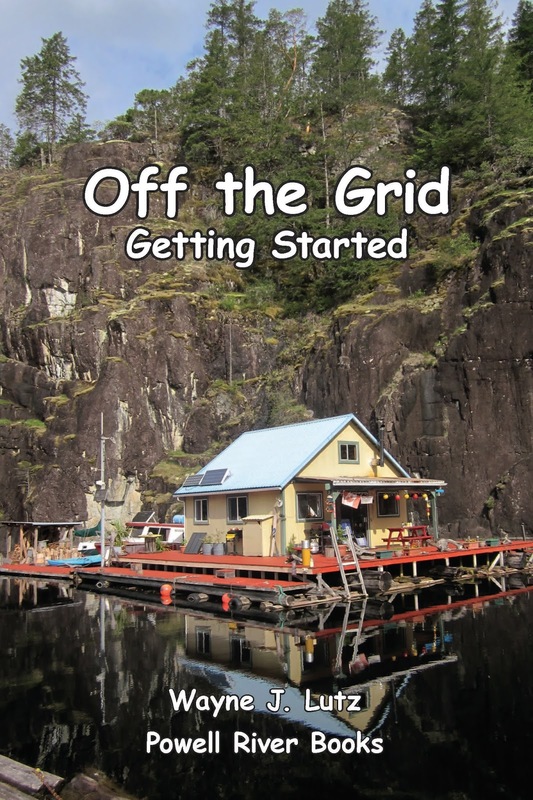 Our site included a BBQ, table and full hookups. 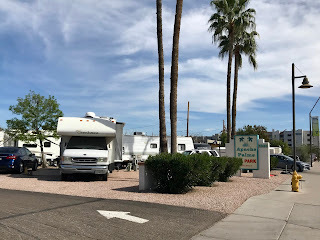 We were pleasantly surprised that a city RV park could be this nice. 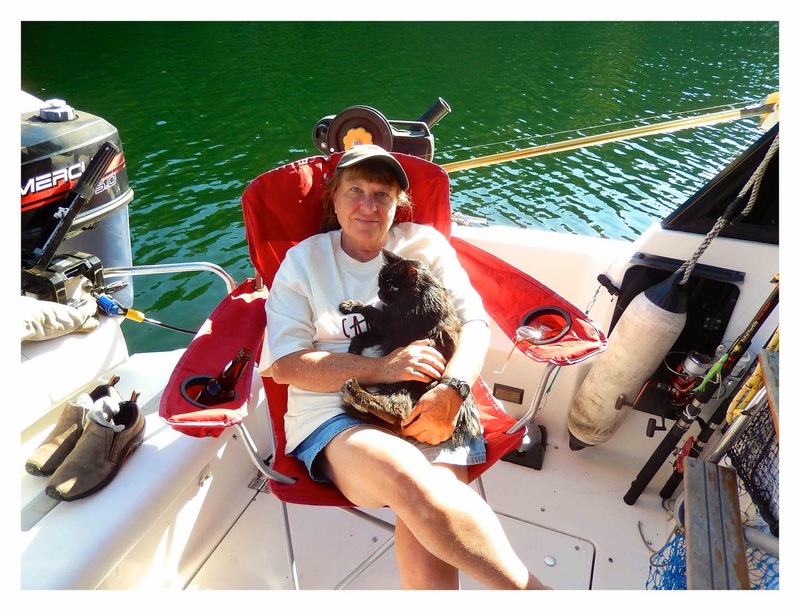 The owners keep it in wonderful condition, and there are drive-through and back-in sites available. 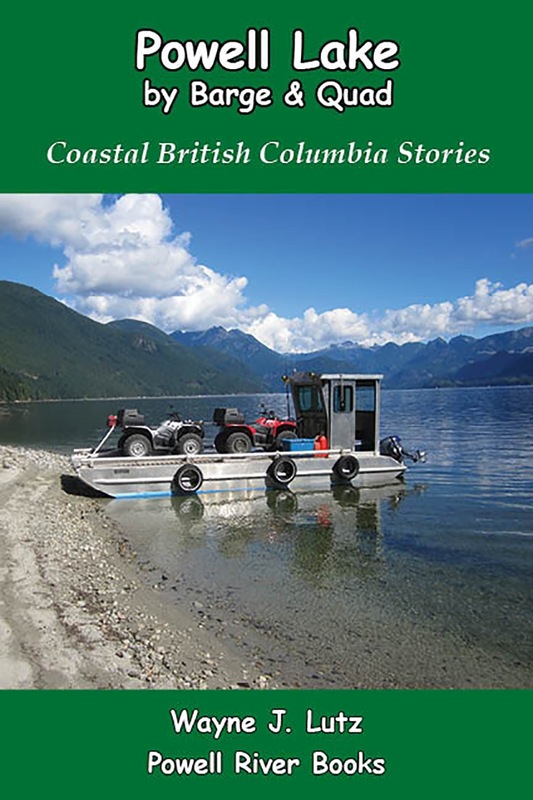 It's very popular, but while we were there a few sites were available on short notice. Friday, February 8 -- We became women's softball fans five years ago. This time of year, schools in warm, sunny states host pre-conference tournaments. Teams from cold regions love to travel and play in nice environments. And we enjoy being Snow Birds to watch. 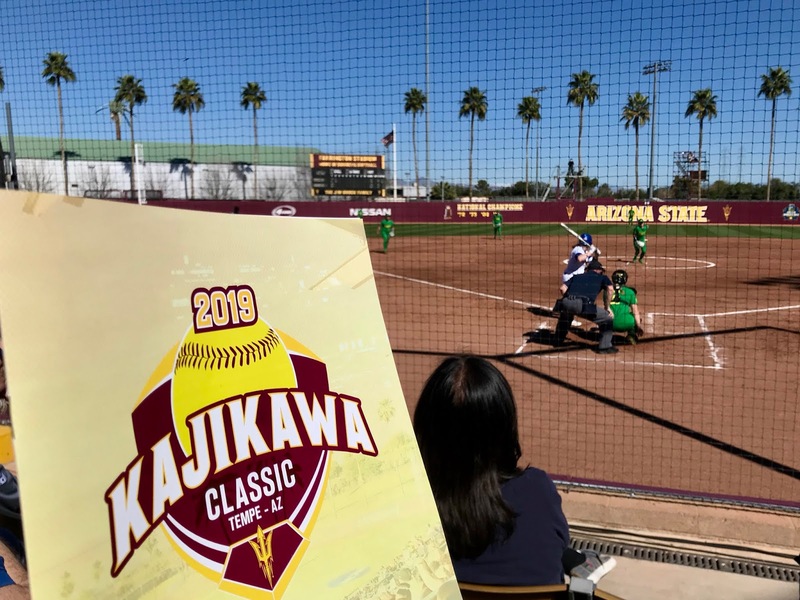 The Kajikawa Softball Tournament at ASU in Tempe, Arizona. We don't tow a vehicle. 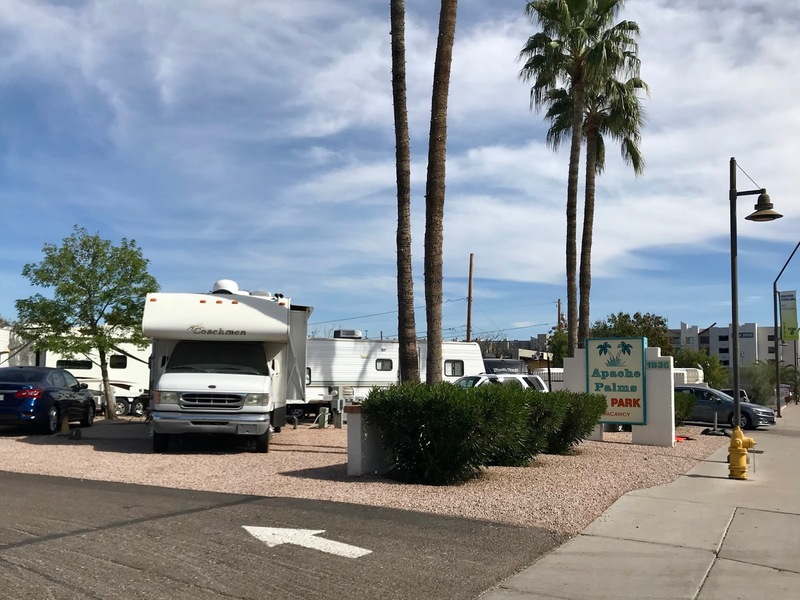 ASU's Farrington Softball Stadium is two miles from the RV park. 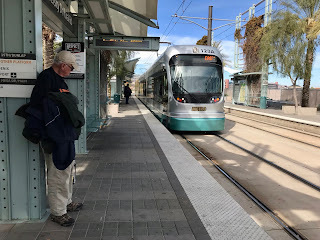 That's walking distance for us, but right out front is a Valley Metro Light Rail station. Wayne waiting for the Valley Metro Light Rail. We purchased $2 senior day passes to ride to and from ASU. From there, it was a short walk to the games. I love cities that have public transportation that's easy and inexpensive. 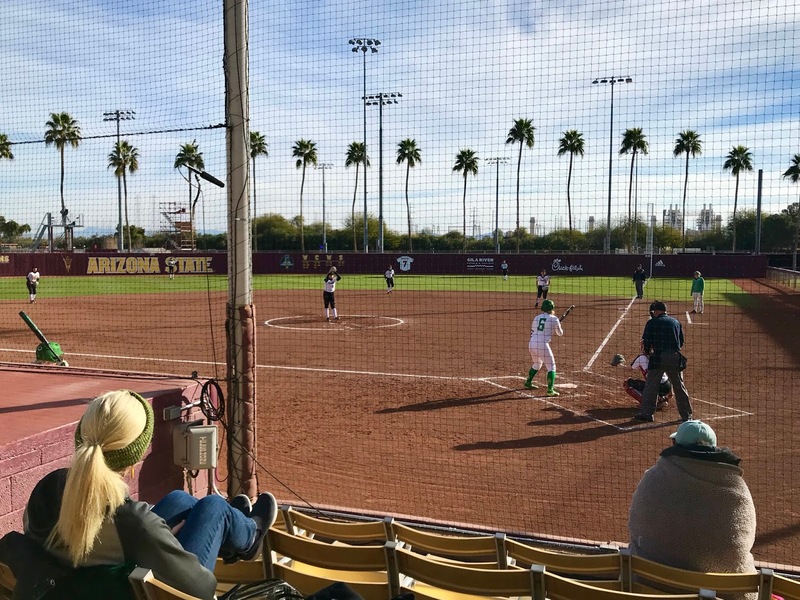 Saturday, February 9 -- Teams attending the softball tournament were from across the country. From our Pac-12 region there were ASU, Standford, University of Oregon, Oregon State and Utah. The other teams were Western Michigan, Kansas, Cal State Northridge, Missouri, Seattle University and Weber State. University of Oregon at bat on a cool but sunny morning. Since the University of Southern California doesn't have a women's softball team we can be free-agent fans. In fact, we can root for good plays by both teams in the same game. Do you enjoy sports? Do you prefer college or professional games? Do you like to go to games like I do, or do you prefer televised events? 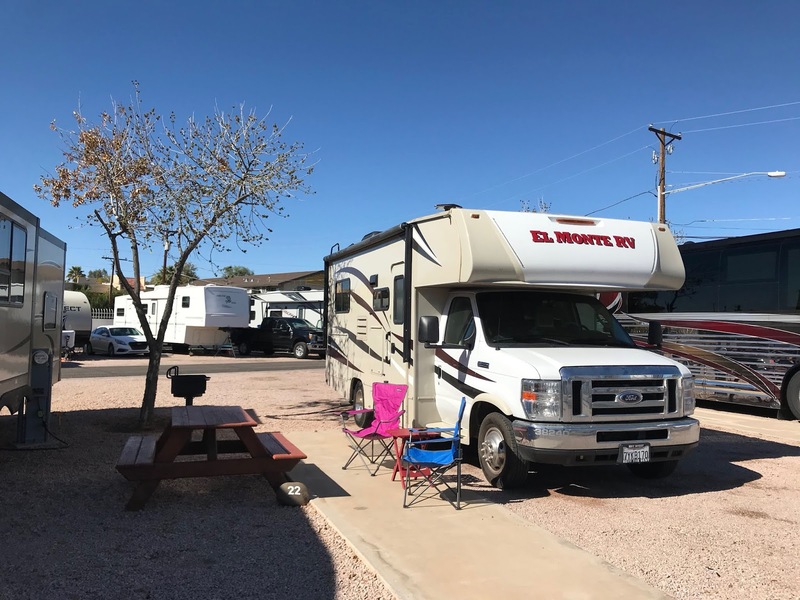 RV Maintenance -- Just because you've rented an RV doesn't mean you don't need to keep it well maintained while on the road. 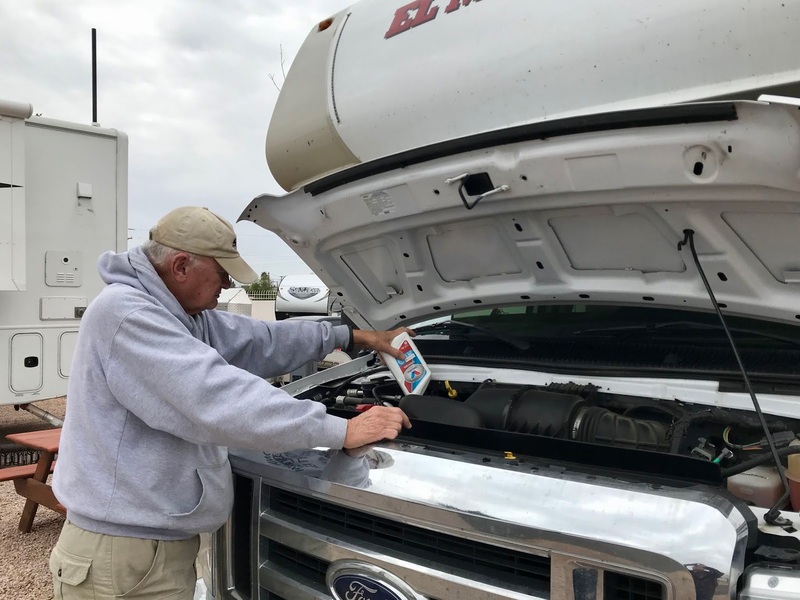 Checking your oil and fluids regularly shouldn't be overlooked. Wayne adding oil half way through our trip. I love it! It's quite a culture, with lots of supports.